So I stash away a lot of clothing but there are always items that pop up that you must lay your hands on because they are gorgeous or you may have forgotten the need for them (see puddlesuits). First G. She needs long sleeved tops. I plan at least 5 long sleeved or short sleeve tops depending on the season. Zara has a great range and I’m loving the Boys section rather than the Girls. 1. The featured tree print tee is £6.99 and a grey mark jersey base that will look fantastic with some colour, popping fushia cords from Little Bird that I have tucked away. 2. The 3D textured heart sweatshirt. An ideal, layering piece from H&M. There is a coordinating skirt too if you wanted a 2 piece set and a grey colourway but I love the navy with bright red hearts. This would see you thru till Spring. 4. I usually just want brights for my kids. Handy to spot them when out and about. G already has a yellow coat for AW and I couldn’t decide on a yellow hat, rainbow hat or complimentary purple hat. This grey cute beanie in a purl knit will work with her yellow coat and has the “Awwww” factor with the wee bear ears. H&M are on a roll today. This is new for me a grey hat. Unheard of. 5. Pompom monster pumps. These are crazy shoes. We have some smart navy blue patent t bars from Clarks but these slip ons are eccentricity in footwear form. When else can you get away with this footwear, easily done at 18mths! From Next. 6. Tights, I struggled to find the bright tights I wanted for G. I had to rely on expensive brands that I would worry would be ruined when out walking or jumping or just being a kid. 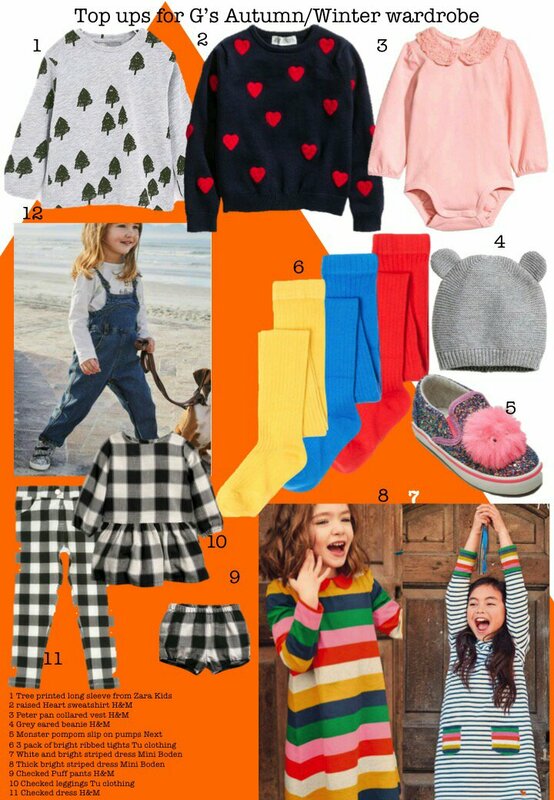 Tu clothing from Sainsbury’s has not disappointed this season with a great selection of brights and patterned tights, at great prices. This is my pick as these will go with everything and with G’s expanding short collection. From age 2-3 years. 7&8. These 2 Mini Boden dresses are just how I visualised dressing G when I found out I was expecting a girl. These are classic shapes, in an easy fit. Boden understand their customers so well and their attention to detail is fantastic. I’m also loving their Wind in the willows range but the toady shoes do not go down to G’s foot size. These 2 dresses are available from Next as part of their branded offer, making Next a real one stop shop. 9, 10 & 11. Checks. I love plaid and oversized gingham. I just love gingham. These puff pants and the check dress are both from H&M. The monochrome check will work nicely with all the brights we have. The puff pants with the bright tights; I love it when half an outfit comes together! The checked jeggings are a cheap steal at £5 from Tu clothing. Bargain. 12. Dungarees. These denim dungas are available from Next as part of their own label offer. Simple and will work with everything we already have stashed away; their denim quality is always excellent and hard wearing which is essential for outdoorsy kids like mine. It does come with a tee but I don’t think we would use it here. All product photos have been taken from the named brand websites. Hyperlinks have been added to the products for ease of finding for the shopper.